Examples of creative works which can be used for this badge (you are not limited to these options). 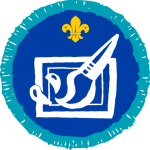 If you want to use another creative art towards this badge, please discuss this with your Explorer Scout Leader. This badge can count towards requirements of the Chief Scouts Award, Queen’s Scout Award, or the Duke of Edinburgh (DofE) Award.